(Bloomberg) -- Syrian troops are preparing an offensive against the last remaining rebel bastion, an assault that could draw in the U.S., displace hundreds of thousands of civilians and cement President Bashar al-Assad’s hold over the country after seven years of war. The attack on the northwest province of Idlib is expected soon. 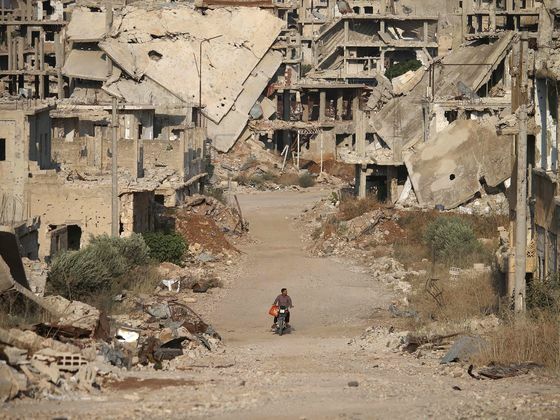 It comes after Assad’s forces, backed by Russian and Iranian allies, retook the southern provinces of Suwaida and Daraa, the cradle of the 2011 revolt to topple him. With an estimated half a million people killed in the conflict, the president is now on the cusp of completing a remarkable rebound, after his fate seemed so uncertain just three years ago. Idlib will top the agenda on Friday, when Russian President Vladimir Putin meets his counterparts from Iran and Turkey. The three have a shared interest in defeating thousands of jihadists holed up in Idlib, some of them foreigners. But Putin, and Turkey’s Recep Tayyip Erdogan, have other worries that may combine to rein back Syrian forces. A prolonged battle that kills large numbers of civilians might push a destabilizing new wave of refugees toward Turkey, while undermining Russian ambitions to eventually win Western acceptance for Assad staying in power. Diplomatic efforts to avert the offensive have intensified even as military preparations accelerate. United Nations envoy to Syria Staffan de Mistura predicted it would be “the most horrific tragedy to the largest number of civilians” in the course of the civil war. U.S. President Donald Trump -- who has ordered two airstrikes on Syria since taking office last year -- has warned against a “reckless” assault on Idlib. The U.S. plans to chair a UN Security Council meeting on Syria on the same day as the Russian-Turkish-Iranian summit in Tehran. It was not clear what action the Security Council could take with Russia insisting that jihadists must be rooted out of the area. On Wednesday, the Syrian army fired shells into Idlib, with loud explosions heard at the Turkish border, according to Turkey’s Hurriyet newspaper. Aircraft and armored vehicles were moved from major military bases as a precautionary measure in case of airstrikes to punish Assad’s government, the U.K.-based Syrian Observatory for Human Rights, which monitors the war through activists on the ground, said in an emailed statement. Russian Su-34 bombers destroyed a workshop that supplied an al-Qaeda-linked militant group with fighters in Idlib, Interfax reported, citing the Defense Ministry. “The summit is necessary to talk Erdogan into not interfering with the Idlib operation,” said Alexander Shumilin, a Middle East analyst at the Institute of Europe in Moscow, noting how Turkey could order its forces into action if it felt threatened. About 2.9 million people live in Idlib, including 1.4 million forced out of opposition-held towns and cities by government offensives. Around three quarters of them need humanitarian aid, and about 10,000 are al-Qaeda-affiliated fighters classified as terrorists, according to the UN. The concern is Idlib’s residents will have nowhere to flee unless the government opens humanitarian corridors into areas it controls. Turkey, already home to the largest number of Syrian refugees, has warned against an operation that triggers another exodus, including possibly jihadists, and has deployed tanks on its border. Foreign Minister Mevlut Cavusoglu acknowledged the threat from radical militants but said a large-scale offensive could lead to a “disaster” for all sides. Erol Basaran Bural, an ex-Turkish army officer and analyst with Ankara’s 21st Century Institute, said Assad’s determination to crush his opponents risks a catastrophe if he ignores others urging him to hold back. Exacerbating the menace is the potential use of chemical weapons. “We all are aware that both the government and al-Nusra have the capability to produce weaponized chlorine,” de Mistura said, referring to the largest jihadist group. The U.S. and Russia exchanged warnings in August about a possible chemical attack in Syria after U.S. National Security Adviser John Bolton told his Russian counterpart, Nikolai Patrushev, that the U.S. is ready to strike back if the banned weapons are used as intelligence reports suggested. Russia’s Defense Ministry parried by accusing the U.S. of collaborating with al-Qaeda-linked rebels who were preparing to stage an incident that would serve as a pretext for another round of Western attacks on Assad. Defense Secretary Jim Mattis said the U.S. has “zero intelligence” to support Russian charges that Syrian opposition groups possess chemical weapons that they are ready to use. In April 2017, and again a year later, the U.S. carried out limited airstrikes on Syrian targets as punishment for what it said was the use of chemical weapons. Bolton said any U.S. action would be stronger this time, according to people familiar with the U.S.-Russia talks. Both U.S. and Russian warships are in the Mediterranean. Three years ago, it seemed unlikely that Assad would find himself on the brink of victory, controlling less than a quarter of the country. Russia’s entry into the war on his behalf in late 2015 turned the tide. 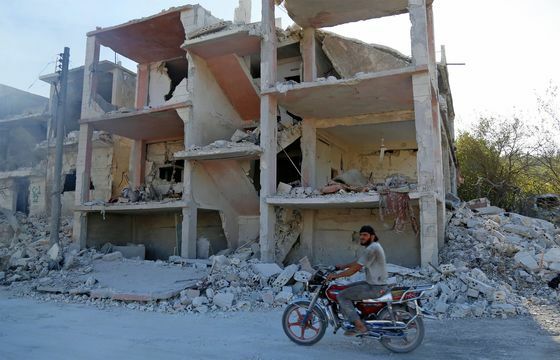 If he retakes Idlib, Assad and his partners will hold sway over about two thirds of Syria’s territory, including the major population centers, according to Rami Abdurrahman, head of the Syrian Observatory for Human Rights. According to his estimates, about 28 percent of Syrian territory will remain in the hands of U.S.-backed Kurdish separatists instrumental in ejecting Islamic State from Syria, but who have been weakened by border skirmishes with Turkey. Turkey views the Syrian Kurdish forces as an affiliate of the PKK separatist group it has been battling for more than three decades in the Turkish southeast, and has denounced Washington for supporting them.